US, 1990, 109 minutes, Colour. John Goodman, Julian Sands, Jeff Daniels, Harley Jane Kozak. 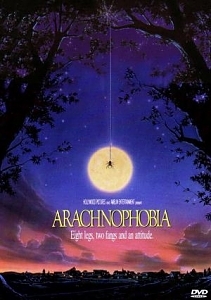 Arachnophobia is a very enjoyable animal menace film. It is reminiscent of the B-budget supporting features of the '50s, Tarantula, etc. However, it is done with '80s panache and style. The film has all the popular ingredients: a mysterious spider transported from Venezuela, wreaking havoc in a small American town, the victims, the inept police, the experts and their comeuppance, the heroic family who confront the menace and overcome it. The film has a good cast led by Jeff Daniels as the father of the family. Julian Sands is the professor. John Goodman has an engaging role as an insect eradicator. The film has comic elements as well as the serious, a good blend of both to satisfy most audiences. Direction is by Frank Marshall, producer of many of Steven Spielberg's films. 1. Entertaining story? The effect of spiders and audiences responding to their menace? An enjoyable cinema scare? 2. The tradition of the B-budget films of the '50s, Jaws and its tradition? Audience familiarity with the genre, plot devices and characters, situations? 3. The Venezuelan locations and their beauty and sweep, the hole in the mountains, the flora and fauna? The foundation for the plausibility of the story? 4. The contrast with the ordinary American town, homes, barns, cellars, etc? Audiences identifying with the characters and their plight? 5. The editing and pace, close-ups? Stunt work and special effects? The spiders, shadows? 6. Professor Atherton and his quest, his staff, the trek in Venezuela, the dangers, the photography, the specimens, the spider, the death of the photographer, the reactions, putting him in the coffin, the spider migrating to the United States? 7. The critique of experts, interfering with nature? The spiders? The crow and its taking up of the spider, dropping dead? The voice of the sheriff and his criticisms of the experts? 8. Ross and his family, migrating from the city, their plans, the arrival, the house, fear of spiders? Hopes? The difficulties with Dr Metcalf and his not resigning? Margaret and her help, the appointment, her advice? Consulting her? The party? A future? 9. Ross, personality and skills, his wife? The family? The photos? The barn? Making friends in the town? 10. Margaret at the party, the aftermath, going home, her death? The sheriff and his small town hostility? Dr Metcalf and his arrogance? The sports team, the player, the cough, his death? Dr Metcalf and his influence, at home with his wife, the exercise bike, his death? The girl threatened in the shower? 11. The insect exterminator and his personality and style, work, his manner of speaking, confronting fears, challenging the insects? Working with people? Good comic touches? 12. Professor Atherton and the consultation, his disbelief, sending his assistant, arrival, search, the mortuary people, their examination of the corpses - and their deaths watching television? The coroner and his fears? His decision to support the scientist? Information, the participation? 13. The sheriff, his continually hindering things, prejudice? 14. The build-up in the town, Ross and his wife, the family, looking for the spider's centre, the barn? Going inside the house, the threat of the many spiders, the escape? 15. Ross, his arachnophobia, finding the nest, the confrontation with the spider, in the cellar? The comedy with his good wine? The final fight? His conquering? 16. The professor and his death - poetic justice? The assistant and his help?